Legislation initiated by a coalition of San Diego superyacht businesses led by Vice President Todd Roberts of Marine Group Boat Works and championed by Assemblyman Martin Garrick was signed recently by Governor Jerry Brown. Assembly Bill 2005 will improve commerce by easing bureaucratic regulations for large recreational vessels entering California ports. “Our coastal cities and towns rely on tourism, and AB 2005 will make it much easier for California to roll out the welcome mat. With the America’s Cup already underway we can expect an influx of large private yachts visiting California. My legislation will ensure those recreational and tourism dollars will be spent here rather than ports in Mexico or neighboring states,” said Garrick. Under current law, non-commercial vessels greater than 300 tons including superyachts have to comply with onerous and costly reporting requirements prior to entering California waters. Assembly Bill 2005 maintains the reporting requirement but allows vessels an expanded timeframe for compliance. “As a small business owner, it’s refreshing to see action being taken on legislations that benefit the economy. It’s even more refreshing to see lawmakers work with businesses rather than creating barriers for their growth,” said Ann Kinner, owner of Seabreeze Books and Charts in San Diego. Kinner played a key role in introducing Roberts as a marine industry expert for Garrick to source. 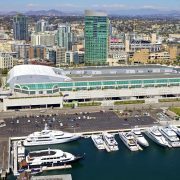 Roberts, a California Maritime Academy graduate, oversees two superyacht facilities in San Diego – Marine Group Boat Works, a refit facility with the capacity to lift and service vessels up to 220 feet, and Fifth Avenue Landing, a boutique marina located downtown. Roberts, among brokers, marina managers, yacht agents and other professionals in the San Diego yachting industry, worked together to take legislative action. “Don’t underestimate the power of our political system. This is a prime example of how important and effective it can be to know your local politicians and to write those letters of support,” said Roberts. Roberts worked closely with Garrick to get the bill approved. During Senate hearings, Roberts pointed out that incoming superyachts would bypass California often and stopped to resupply in Mexico, Washington or Oregon instead. Yacht owners would rather avoid California than to deal with the state’s burdensome and time consuming reporting requirements. According to an economic impact study conducted in 2002 for the Marine Industries Association of South Florida, a trade group based in Fort Lauderdale, and the Broward Alliance, a public/private economic development organization, for every $1 spent on yacht repairs, another $7 goes into the local economy, as owners and crews seek hotel rooms, restaurants, shopping and entertainment during the repair process, which can take anywhere from a few days to more than a year, depending on the scale of the project. The revenue potential for local coffers is huge, as yacht owners can expect to spend at least 10 percent of the vessel’s purchase price in routine maintenance. For Florida’s Miami-Dade, Palm Beach and Broward Counties, superyacht owners contributed more than $576 million to the local economy. “I worked with various state agencies, boating enthusiasts and industry representatives for several months to craft a measure that would maintain environmental safeguards but create a more efficient and realistic reporting timeframe. I believe AB 2005 will greatly benefit our local economy and California as a whole,” said Garrick. 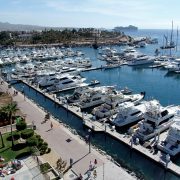 Marine Group Boat Works is a full-service boat and San Diego superyacht repair and refit facility with a second location in San Jose del Cabo. 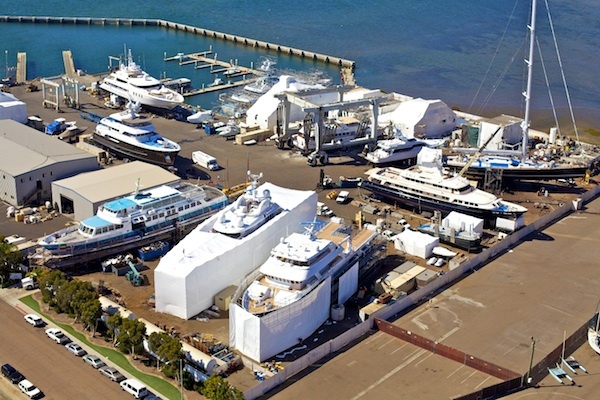 The shipyard’s services include haul outs, repair, retrofit, hull extensions, conversion and custom painting for boats, superyachts and government and commercial vessels up to 665 tons. Marine Group Boat Works has been featured on The History Channel’s “Modern Marvels” for having the largest Travelift in the nation. Marine Group Boat Works has serviced superyachts including MR. TERRIBLE, RONIN, TAMSEN, ZENJI, EXUMA, ORION and BANDIDO; commercial vessels for companies including Foss Maritime, Evans Hotels and San Diego Harbor Excursion; and government vessels for agencies including the U.S. Navy, Port of San Diego, U.S. Coast Guard and San Diego Harbor Police. For more information, visit www.marinegroupbw.com or call +1(619) 427-6767 or email refit@marinegroupbw.com. – Resource Directory where we provide info for places – rental/hired cars, accommodations, spas, etc. – that extend special discounted rates to our guests. 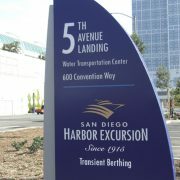 – News and Events Blog and Calendar to keep you updated on the latest happenings at Fifth Avenue Landing and fun activities around San Diego. – Recommendations and reviews from past and present owners and crew — and where you can share your own! So be our guest, browse our website, explore our city and make Fifth Avenue Landing your home away from home…away from home. 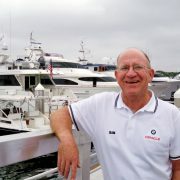 Neil Wilson was recently hired for the dual role of marina manager for Fifth Avenue Landing, LLC, a boutique megayacht marina located in downtown San Diego, and director of business development for Marine Group Boat Works, LLC, a superyacht repair facility located in Chula Vista, Calif. with a new location in Los Cabos. 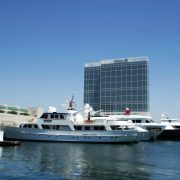 SAN DIEGO — Fifth Avenue Landing, San Diego’s luxurious new downtown docking facility for super-yachts up to 300 feet long, is just the latest development in the city’s growing super-yacht industry, according to a report onCNN.com. These large watercraft have a growing presence throughout the waters from the Pacific side of Costa Rica all the way up the coast to British Columbia and beyond. Demand from Silicon Valley moguls, business owners, and athletes has been the engine driving the yachting industry forward, particularly during the last 10 to 15 years.